George Eaton Atkinson was born 19 June 1915 in Port Rowan and was married to the former Jean Galt, who resides in Port Rowan with a small son. She first received word on Friday that her husband had been wounded, further information received on Tuesday indicating that the wounds were of a serious nature. Lt. Atkinson a graduate of Simcoe High School and Queens University was an athlete of note having starred as a pitcher for the Port Rowan baseball teams. On July 29, 1943, the 3rd Canadian Infantry Brigade was attacking Catenanuava, Lt Atckinson’s platoon was detailed to make a crossing over the dried river bed to the southwest of the town in order that close support weapons could get across to support the attacking infantry. This officer organized and led his platoon in a very gallant manner. 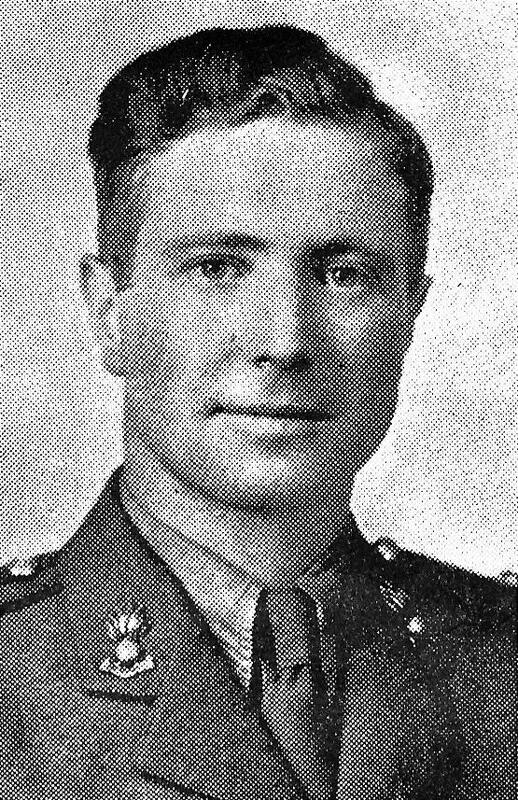 His personal example of courage was largely responsible for the successful completion of the road although work was carried out under continuous mortar and shell fire. As the task was completed this officer lost his left arm and suffered mutilation of the right arm. In spite of this he continued to command his platoon until all other casualties and the rest of this platoon were evacuated. Atkinson Lake, Northwest Territories was named after George.